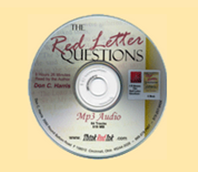 The Red Letter Questions (Audio) book is recorded in MP3 format on a single disc. This book is nine hours and is read by the author, Don Harris. Don describes the progression of insights and revelation given that he received during the journey that changed his life forever. These are heartfelt thoughts of a man who, through traditional misinterpretation of Scripture, inadvertently disobeyed the God he claimed to love and serve. The traditions of men and false assumptions had become a part of Don’s everyday life (just as they may be in ours). Discovering the truth behind these poignant red-letter questions set him free and it will set you free as well. 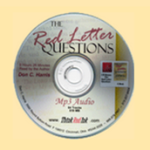 The Red Letter Questions is a fresh look at the recorded questions asked by the Messiah during His ministry on earth. Let the questions transport you to the feet of the Messiah. Open your ears and your heart to hear His questions anew and find your own answers–answers that will cleanse and change you forever. Also available, The Red Letter Questions, in CD format plays on all CD Players. This format requires eight discs to capture the 9 hour read by the author, Don Harris. “Get the Red Out” – Then Read It ! My favorite lesson from the Bible has always been the one where Jesus was stunned to find no greater faith than that of a Roman centurion’s in all of Israel. In Red Letter Questions, Don Harris indeed points the way to attaining this type of faith – even if you think you already have it. But don’t look for ten easy steps to salvation here; instead, Mr. Harris relies on over 150. They’re tough, thought-provoking, incisive, divisive, soul-searching, and can be downright antagonistic. They better be; they came from the Master himself! For Don Harris didn’t take the easy way out and give you his educated opinion formed from years of experience and scholarly study. In this case, he goes straight to the source; the very questions Jesus asked of every man that has ever read or heard the Gospel.